Whenever I start gnome-terminal, it opens to 80 columns x 24 rows. That is too small for my taste. Henceforth, I want it’s default size to be 80×50. 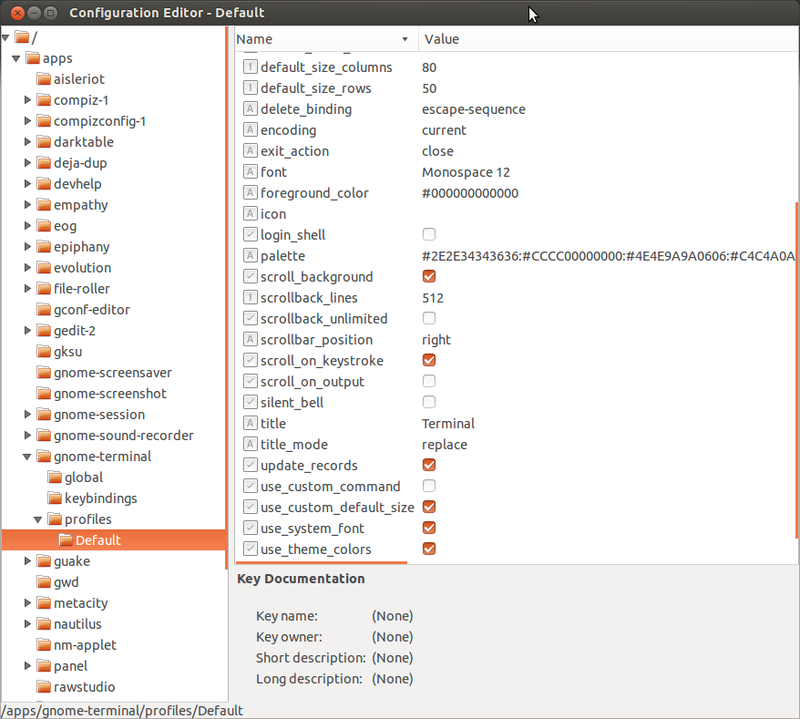 Install gconf-editor. Recently, I wanted to hold my virtualbox software at version 4.04 and prevent it from being upgraded. 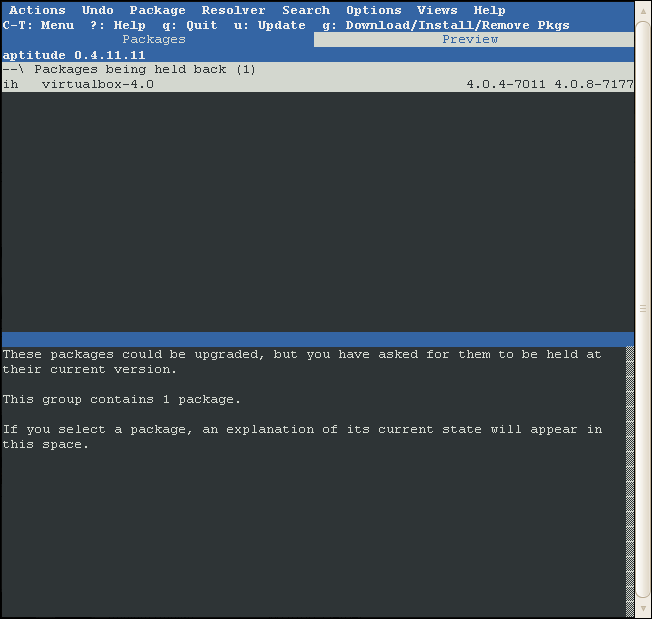 If you use the gnome update-manager, you can always deselect the virtualbox package in the GUI each time. If you don’t like having to do that each time, I will show you two additional methods. The first method using aptitude and the second method using dpkg/apt-get. Choose one method or the other, the two methods are independent. Use aptitude to place a hold on a package and this will allow aptitude to upgrade everything else except packages that you have “held back”. I’ll show you how to place a hold on the virtualbox package (virtualbox-4.0). Your first action should always be to update your repo cache. Hit the “u” key. Next, search for virtualbox. The “/” key will bring up a search box. Enter virtualbox and hit enter. If virtualbox is installed, aptitude should find it. Hit the “=” key to place a hold on the virtualbox package. You should see the flags “ih” now associated with the virtualbox package. This means that virtualbox is installed and there is a hold placed on it. It won’t be upgraded while it is held back. Whenever you want to clear the hold flag, search and select the virtualbox package again and hit the “:” key. That will remove the hold. To upgrade your server. Use the arrow keys to go to the top of the list and select the Upgradeable Packages. Then hit the “g” key. Hit the “q” key to quit aptitude. Packages that are held back will still show in the Upgradable Package list whenever there are upgrades available for download. If you try to upgrade it, it will be skipped. As shown below. If you prefer to use the cmdline, this is how to do everything that I just talked about, place a hold on virtualbox and upgrade everything (except virtualbox). To place a hold on virtualbox and upgrade everything (except virtualbox). To remove that hold on virtualbox and upgrade everything. Whichever method you choose, please remember that each method is independent of the other. In other words, if you use aptitude to place a hold on a package, then apt-get won’t see that hold. If you place a hold using dpkg, then aptitude won’t see that hold either. So remember to be consistent with whichever method you choose. Yeah, it’s a bit nuts.